Bootstrap Business: What 7 Technologies are Overhauling the Food Service Industry? The food industry might run primarily on food, but the thing that makes restaurants run smoothly is the technology that they use to make running and managing a restaurant easier and more cost-effective. Thanks to technology developing at lightning-speed, the way that restaurants go from ordering to delivering are being completely revamped, and restaurant owners are reaping the benefits. If you aren’t using these seven awesome technologies, you might be losing a ton of revenue. The food industry is guided by very stringent food safety rules and regulations. One of them involves the temperature to which foods must be cooked to to avoid outbreaks of salmonella from uncooked meats and foods. Many restaurants have started to employ Bluetooth technology sensors that check via probe for the temperature of food. 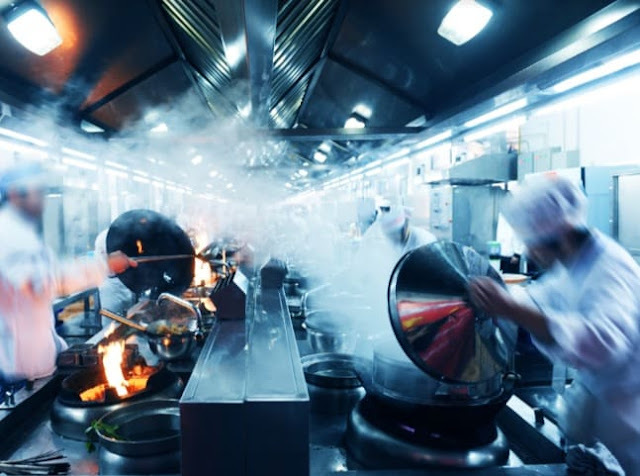 Taking as little as four seconds, managers can make automated temperature thresholds that will alert cooks and chefs when foods are properly cooked. The sensors can also send the recorded temperature readings to the HACCP or other food safety organization, which eliminates a whole lot of red tape and paperwork. Behind the scenes of any restaurant is the chaos of scheduling both the back of the house and the front. New scheduling software can instantly generate digital schedules for every employee and include shift times and positions. It can also generate reports to avoid over or understaffing according to historical data analysis. Being able to record things like staffing budgets helps to reduce overtime pay and save restaurants money. By inputting requests for time off, the new software can do what used to take managers a day in just seconds (and way more efficiently), thereby reducing headache by tenfold. To effectively train new staff, instead of shadowing, the employer can now use virtual reality onboard equipment that takes staff members through their routine by immersing them electronically into their position and how a typical day will go. The virtual tour can show new hires what other employees will be doing, test their individual skills, so the manager can place them effectively and help eliminate typical first day, or even first week, mistakes. Onboard virtual reality uses real, hands-on training without the need for the employee to even be in the restaurant at all. One of the biggest reasons restaurants bleed profits is by not keeping a close eye on inventory. An inventory tracker can better keep an eye on a restaurant’s assets with great accuracy and efficiency. The trackers can be used to watch high ticket items to ensure that they stay put, and aren’t “magically” disappearing without a trace. One of the hardest things for a restaurant manager to handle is keeping inventory like ice-cream, in stock. Running out of items can be just as disastrous as over-ordering and risking perishable food spoilage before those costly ingredients can reach the table. For extra time saving, the automated purchasing software can order things automatically and alert a manager when stock is getting low. It can also compare one vendor's price against another, ensuring that a restaurant isn’t overpaying for supplies. Kiosks are a great tool for both the server and the customer. It allows restaurant goers to order directly from a menu and have their meal delivered in a timely fashion. It also saves costs for the restaurant by being able to limit the amount of time that a server is running back and forth between tables. Cutting out the middleman, the kiosks allow greater customer satisfaction and better delivery in faster time. Nothing can tank your restaurant business more than long wait times to be seated. Digital reservations allow customers to book their reservations. The software can even suggest the best seating time for the number of people in a party. The software also allows your customers to roam the town or complex while they are waiting for their table to be ready by sending text alerts to notify customers when their seats are ready. It can also store information like anniversaries or birthdays as well as a customer's ordering habits and preferences. The restaurant business can be extremely difficult to manage. Take the guesswork out of daily operations, schedules and inventory. By investing in technology, you will quickly see your profit margin rise and have a much more efficiently run restaurant with a higher customer satisfaction rating. I hope you enjoyed this article about the new technologies available for food service industry business professionals and investors. Interested in more articles about the food service industry?